This British pop art design features one of my favorite subjects! And anyone who has followed me for awhile would know that subject before they even saw the artwork. There’s just something about those classic British Telephone boxes. I think these detailed style says something about Britain in the early 20th century – a time period where something as potentially mundane as a telephone booth could become a signature for a nation. And here we are closing in on a century later in a time period when their original use as public phone booths is virtually historic, and many of us are still in love with them! I’m so fond of the classic phone box that they would be the subjects of some of my art no matter what. The fact that others enjoy pieces like this colorful British pop art print is just icing on the cake for me! In fact, this classic four-color British Pop Art was the product of a stormy weekend. The weather outside was gray and frightful and I needed something to cheer me up. The need for something bright and cheerful very much informed the color palette I chose for this British pop art style print. 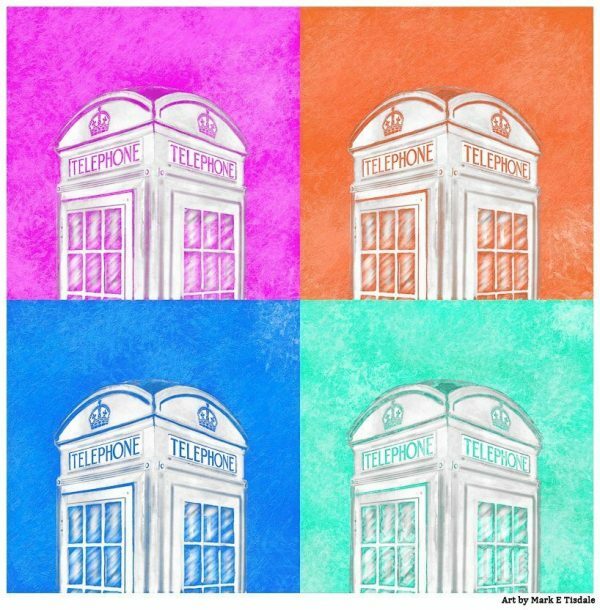 The brilliant pink, blue, orange, and green make me think of a spring day, and the scratched out style of the phone booths was a bit of a whimsical way to portray the classic form of a British icon. I hope this artwork brightens your day as well! Does it bring a little smile to your face? Maybe it would brighten up a gray day for you as well? Or maybe you have a friend who is as crazy for color and the style of these classic phone booths? Hope you’ll take a second to share what drew you to take a moment and enjoy this particular print.